If you have a website, then you have certain steps that you want your visitors to take; fill out a form, make a purchase, learn about a product or service, sign up for a newsletter, that sort of thing. 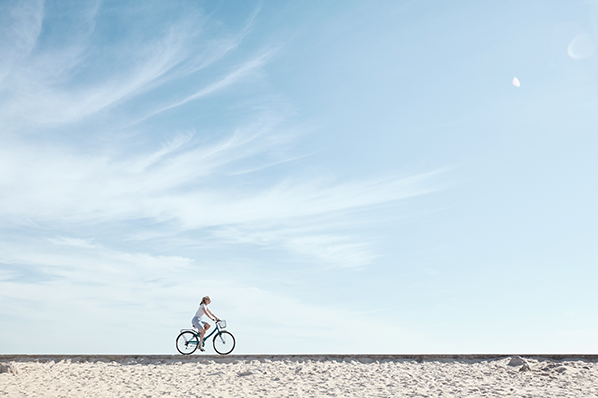 Whether people actually reach those goals, however, is entirely dependent on how easy you make it for them -- as in, how easy it is for visitors to navigate through your website. The best sites are created with a keen understanding of visitors’ interests, needs, and expectations. Text, visual design, organization, and navigation should all work together to allow visitors to find key information and reach a goal -- the one you hope they reach as a marketer -- quickly and easily. To get to this point with your site, you need a clear site structure that is easy to navigate, follows a hierarchy of content, and feels natural and intuitive to visitors. This post is going to give you some guidance around how you can make that happen for your own website. Websites are usually organized around a single homepage, which then links to subpages. Kind of like a tree, with many smaller branches, and sub-branches attached to those, right? Or, you know, a hierarchy ... if you're not took keen on the leafy analogies. 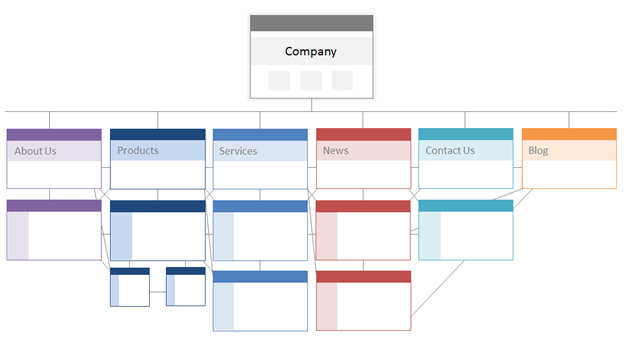 A hierarchical architecture of this form focuses on the organization and structure of content in a manner in which a user can navigate through it intuitively. Such architecture can range from a simple brochure-like site, all the way to a complex information system (see the example site later in this post). As a marketer, you have a tremendous amount of opportunity to impact how easily and quickly visitors reach your intended goal. There are many ways marketers can influence that outcome, but the two biggest pieces of low-hanging fruit are in identifying and defining visitor goals and expectations up front, and then organizing your site’s content areas around those goals and expectations. Identify the "who" (stakeholders and target audience). Identify the "why" (your goals). Identify the "how" (functional website requirements). It’s highly advisable to actually conduct some user testing at this stage, and critically important to do so before you or a designer develops mockups and wireframes/blueprints of your website. You don’t want to run the risk of making costly assumptions or taking wild guesses at this stage. Remember, the aim is to make this site beneficial to your users, and often what we think is important ... really isn’t. Having insight into how your users truly behave and intend to use your site will also lend some clarity to your overall site goals. Once you have a clear understanding of goals and usability, organizing content will be a snap. Knowing what content you need helps define "sections," or "groupings" of content through which, ultimately, you'll build subsections and subpages of your website. The closer you are to your homepage, the more general topics should be. The head sections of your site should paint a broad picture, start the conversation, and draw visitors in. Those head sections of your site should correspond with your primary offers, products, and/or services. 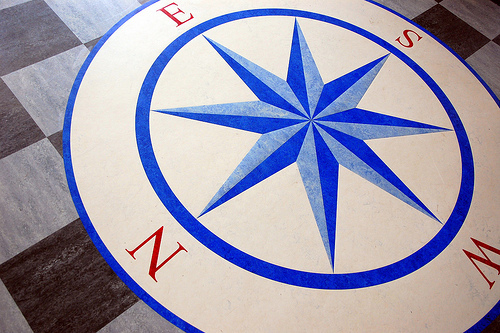 Start by labeling sections, and work to refine those throughout the evolution of your site. You don't have to get the labels 100% right the first time; iterations are your friend, and why you're planning things out in advance! Conducting keyword research can shed light on which terms may be most relevant for that naming. Using analytics from your website’s site search (if you have one) can also prove to be insightful, as it will actually tell you what people are looking for. Make those items more easily accessible so users don’t have to go clicking around for them in the future. Make sure content doesn't overlap from section to section. You want to avoid that redundancy for an intuitive user experience, as well as to avoid possible duplicate content penalties. Section names and the overall flow of the site should be clear and make sense to everyone, not just you. Zappos.com is frequently used as a model for high quality site structure that's centered around user experience. Why? Because everything is where you’d expect it to be. 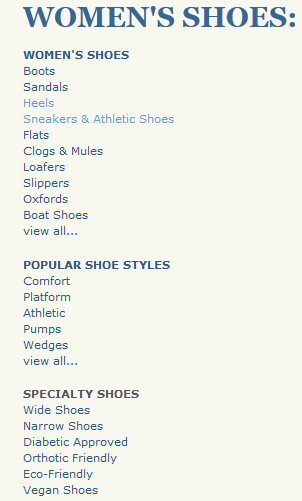 As you hover over "Shoes," for example, you see a drop down list of all their shoe options. Imagine that! Then, if you drill deeper into a particular section, it gives you a more detailed side navigation. Having both top menus as well as side menu items simplifies browsing and allows users to easily jump from one section to another. The clearer and more concrete your site organization, the easier it will become for users to jump freely from place to place without feeling lost. Big win for both of you! Bonus Win: Designing a Site Structure Around User Experience Helps Your SEO! Think about what SEO really means these days: Search experience optimization, with an end goal of increasing conversions. 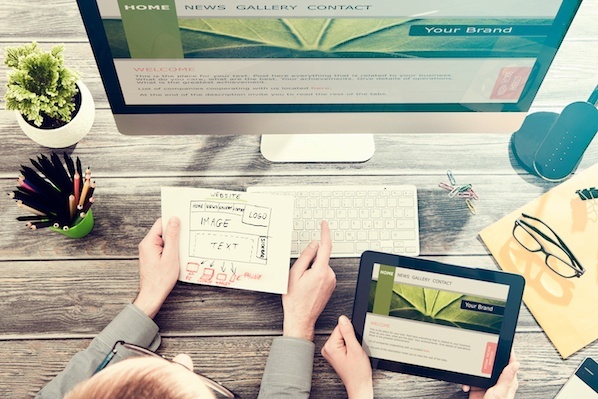 First and foremost, you're optimizing for users and user experience. After that, and only after that, are you optimizing for search engines, whereby you increase the likelihood of your content being found by the right audience. You want your site to be found, right? Right. And you want your site to be used, correct? Yeah, I sure hope so. Well just like Google, who is only as good as the results it delivers, your site is only as good as the experience it gives users. Who do you think Google's going to bump to the top of the SERPs? The site that users love, or the one they can't figure out how to use? As such, a site with proper structure is crafted to meet user expectations, and ultimately help them (and thereby you) reach a desired goal -- whether it be fill out a form, make a purchase, learn about a product or service, sign up for a newsletter, whatever. To get there, follow the site structure recommendations laid out in this post, make sure you create public and XML sitemaps for your website, and keep your site visitor in mind at all times. Your site will be created largely with standard navigational links -- the head sections like “About Us,” “Product,” “Services,” etc. -- and topical links embedded within the content to create a web-like mesh of links. Remember, you're aiming for a tree-like structure that will be broken down by topic. Your keywords will naturally show up in the proper sections/subpages if you break down your site this way that makes sense for both users and search engines. What other tips do you have for marketers concerned their site structure isn't as well optimized as it could be?